This post is the latest installment in my Cooking 101 Series, where I walk you step-by-step through popular cooking techniques and share in-depth tutorials for your favorite ingredients and recipes! We’re talking all about herbs today, folks! 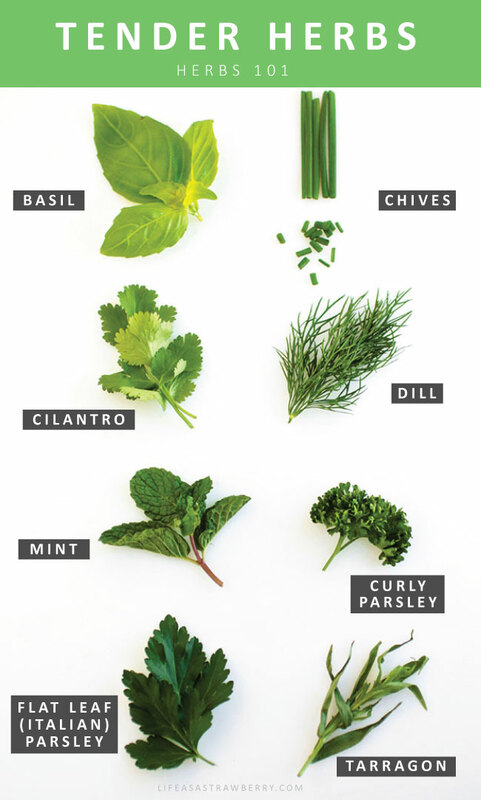 I use fresh herbs almost daily to lend quick pops of flavor and color to my cooking, and – despite having a definitely non-green thumb – I diligently attempt to grow a few varieties every summer. They usually last a month or two before they decide to shrivel up and die (?) but fortunately, my local farmers DO have green thumbs – and they keep me stocked with fresh herbs all day erryday. (Kyle says my herbs die because I use the wrong size pots. I say I’m the victim of a window garden conspiracy. But agree to disagree). Whether you’re a master gardener with an herb garden of your own (TELL ME YOUR SECRETS!) or a fellow plant-killer (??????) 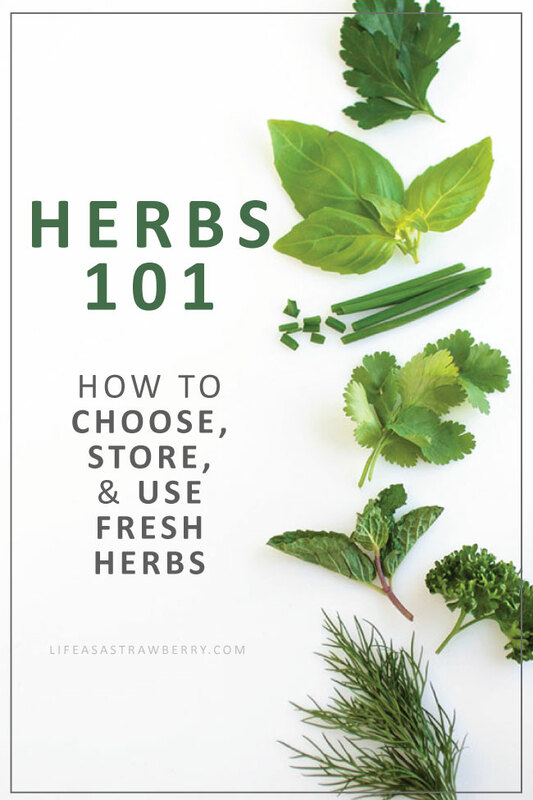 who has to pick fresh herbs up at the farmer’s market, there are a few herb-a-licious tips that will help you choose the right herbs, store them correctly, and help them reach their highest herb-tastic potential. I don’t have time to touch on every type of herb or technique here, and we’ll leave the “how-to-grow-herbs” advice to the people who don’t accidentally kill all their plants (? ), but if you have any herbaceous wisdom to share with us, pop down to the bottom of this post and leave a comment! When we’re talking about herbs, it helps to break them down into two groups: Tender Herbs (also called Soft herbs) herbs and Woody Herbs (also called Tough or Hard herbs). 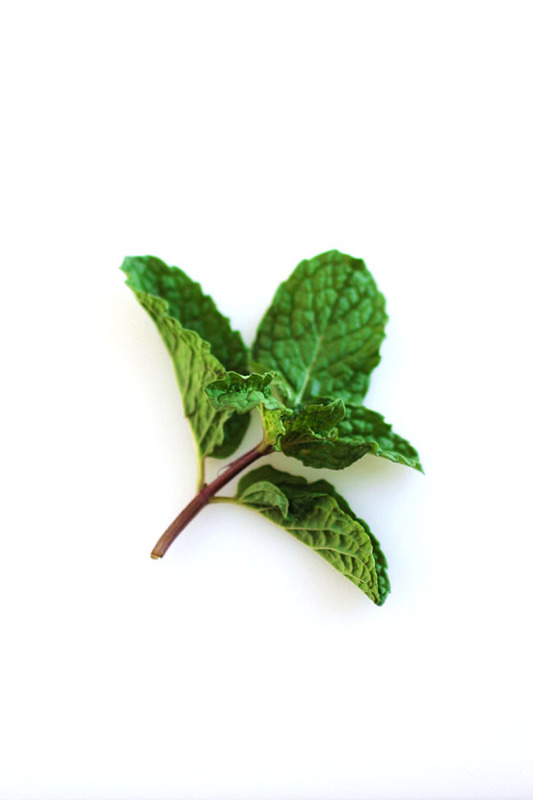 Tender Herbs have softer, grass-like stems and are generally more delicate than Woody Herbs. These herbs tend to be used fresh, and when they appear in cooked dishes they’re typically added right at the end of the cooking process to preserve their lighter flavors. Woody Herbs have tougher, wood-like stems and are not typically served raw. Woody herbs can stand up to cooking much better than tender herbs, so they tend to appear in cooked dishes where they’re able to infuse their flavors into the recipe. Use tender herbs as garnishes on your favorite dishes, blend them with a bit of olive oil and garlic for an easy pesto, or add them to salads, dips, and salsas for a pop of fresh flavor. Be careful not to overcook your tender herbs. Because their flavors tend to be more delicate, aim to use tender herbs raw or add them at the very end of cooking to preserve their taste. The stems of tender herbs are generally not very tough, so it’s ok to chop up and use the smaller stems along with the leaves (instead of meticulously de-stemming each leaf). Basil – The quintessential summertime herb! Blend it into a fresh pesto, stir it into a hearty tomato sauce, or slice the leaves up and use them to top caprese salads, bruschetta, margarita pizzas, and more. Basil can bruise easily, so make sure you use a VERY sharp knife when cutting it to make sure you’re slicing (rather than crushing) the leaves. Chives – Try fresh chopped chives as a garnish on baked or mashed potatoes, mix them into a potato salad or a batch of scrambled eggs, and stir them into sauces or add them to fluffy breakfast biscuits. Their milder, onion-y flavor also makes chives the perfect choice for kids or picky eaters who may not love a strong onion taste. Cilantro – Ahhhh, cilantro. You either love it or hate it. If you’re in the “YES TO CILANTRO” camp with me (HEY-OH! ?? ), try this herb in fresh salsa, guacamole, as a garnish for tacos, or stirred into curries for a bright, fresh pop of flavor. Dill – Fine, tender leaves make dill quick and easy to chop. Stir it into potato salads or scrambled eggs, use it to top a filet of roasted wild salmon, or add it to a quick vinaigrette to dress up your salads. Curly Parsley – With tighter, curlier leaves than its flat-leaf cousin, curly parsley is a popular choice for garnishing your favorite dishes. Parsley is also delicious mixed into dips: stir chopped parsley with ricotta and a bit of honey for a fun spread, or whip it together with cream cheese and a bit of garlic to elevate your morning bagel game. 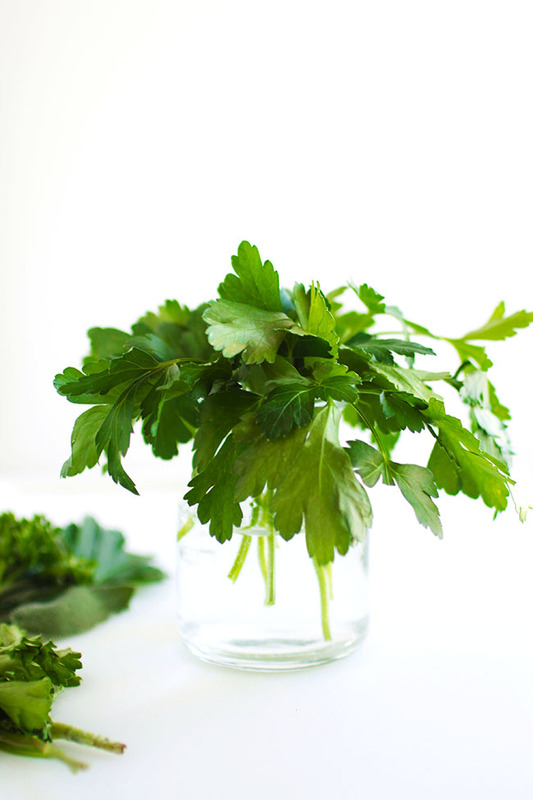 Italian Parsley – This flat-leaf parsley is perfect for garnishing recipes and stirring into your favorite sauces. I love it tossed with fresh mussels in a white wine sauce! Tarragon – Tarragon has a deep, almost licorice-y flavor that pairs well with chicken and heartier, butter-based sauces. Add it to scrambled eggs or toss chopped tarragon with a bit of olive oil and use it as a marinade for grilled chicken or roasted vegetables. Woody herbs stand up to cooking much better than their tender counterparts, which makes them a great choice for recipes that call for roasting or braising. Woody herbs aren’t typically very tasty when raw, so plan to cook them into whatever dish you’re making. Because their stems are tough, it’s a good idea to remove the leaves from the stems and use only the leaves in your cooking. To do this, hold the end of the stem in one hand and run the thumb and forefinger of your other hand down the stem from top to bottom, pulling the leaves off of the stem as you go. It helps to pull leaves off in the opposite direction of which they’ve grown, especially with herbs like Rosemary and Thyme. 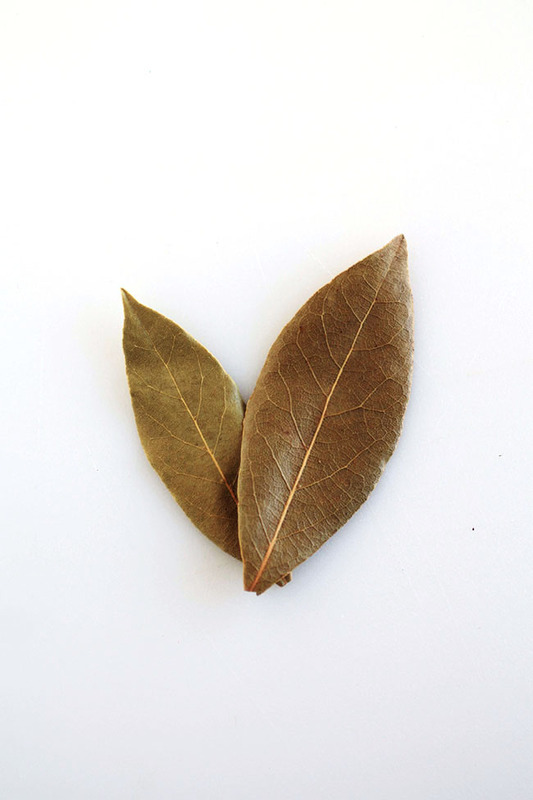 Bay Leaves – Bay leaves are a wonderful addition to braised sauces and homemade stocks. These leaves are typically pretty bitter when eaten by themselves, so plan to leave them whole and pull them out of your sauce or dish before serving. Add bay leaves to red wine braised beef, use them in a creamy béchamel sauce, or add them to your homemade stock to extract some of their earthy flavor while it cooks. Bay leaves are typically found dried (rather than fresh), which is actually a good thing – dried bay leaves have a much more consistent flavor and keep for a LONG time, so this is one case where I’d recommend you choose a dried variety over a fresh one. 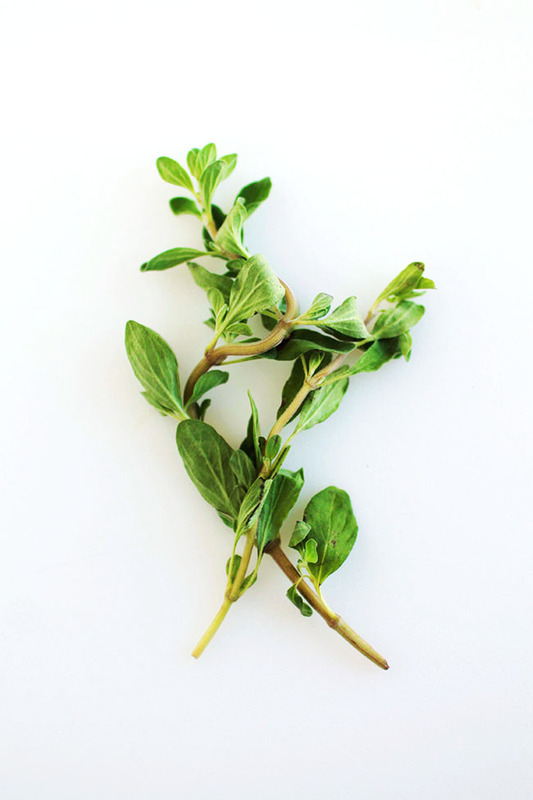 Marjoram – Marjoram has a slightly sweet, almost minty taste, and is actually a member of the Oregano family (they’re often mistaken for each other!) Add it to a quick vinaigrette for your salad, use it to infuse olive oil, or add it to a marinade for roasted chicken or vegetables. Oregano – Marjoram’s BFF (and occasional doppelgänger), oregano is delicious mixed into dressings, added to a roasted tomato or roasted vegetable dish, or stirred into tomato sauce for a fun twist on your classic pasta marinara. You can also use it to flavor homemade sausage if you’re feeling ambitious! Rosemary – Use rosemary to infuse your own olive oil, add it to your favorite cocktails, mix it into cornbread, and use it in a marinade or rub for roasted chicken, pork, or vegetables. It’s also delicious in these easy Salted Rosemary Wheat Bagels or a decadent mashed potato recipe. Sage – The deep, earthy flavor of sage is perfect for homemade sausage, Thanksgiving stuffing, and pasta or gnocchi dishes with a browned butter sauce. Pair it with lemon and chicken for a bright but earthy dish, or mix it with unsalted butter for a unique spread. Thyme – Use it in homemade jam, add it to your favorite risotto, or sauté it with fresh portobello mushrooms for a delicious pizza topping, side dish, or ravioli filling. Thyme also adds a fun twist to a classic grilled cheese sandwich or your favorite cocktail! No matter what types of herbs you buy (and no matter what kind of packaging they’re being sold in) look for bright color and crisp leaves. Choose herbs that are free of bruising and have no crushed leaves. Fresh herbs are easy to store at home! 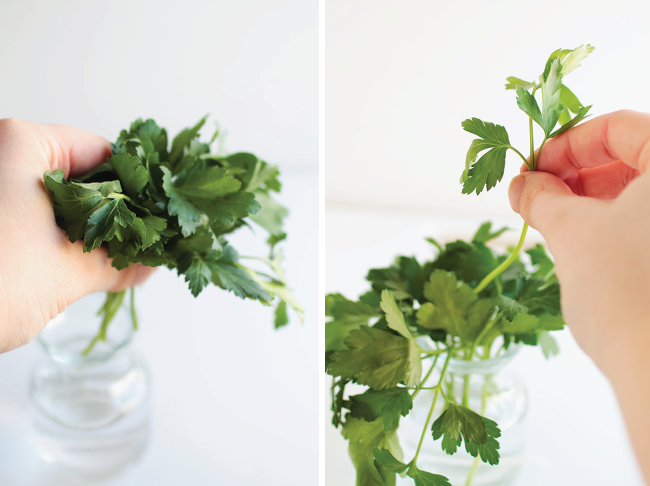 Remove any rubber bands or twist ties from the herbs so they can breathe a little bit. Fill a short glass or vase with an inch or two of water and put stemmed herbs like cilantro and parsley in the glass just like you’d put flowers in a vase. Store herbs on the counter and away from direct sunlight for 2-3 days (you may need to change out the water once or twice to keep things fresh) or in the fridge for up to a week. 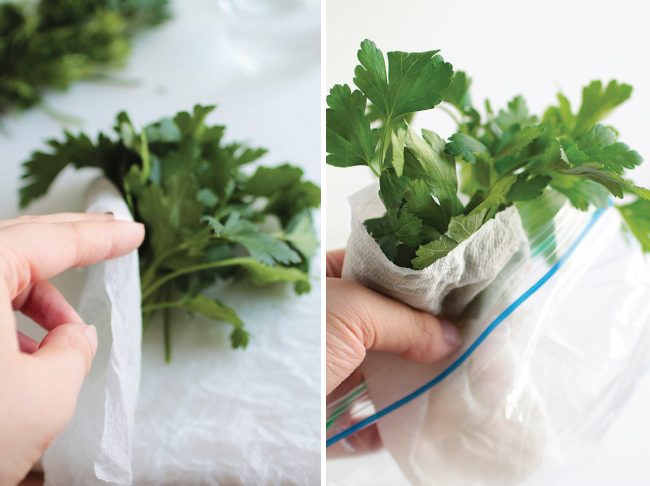 Alternatively, you can wrap herbs in a damp paper towel and place them in a plastic bag in the fridge. This wrap-and-bag method works well for herbs that don’t have long stems (like sage, chives, and rosemary). Also, because excess moisture can lead fresh herbs to spoil more quickly, try to avoid washing your herbs until you’re ready to use them. When you’re ready to wash, give them a quick rinse under cold water (⬅️ lazy girl method) or place herbs in a bowl of cold water and swirl them around until they release any sediment or impurities. Lay herbs in a single layer on a tea towel to let them dry or give them a quick whirl in a salad spinner to remove any excess moisture. I get a TON of questions about the proper way to cut herbs – and we’re going to break it down in just two easy steps! 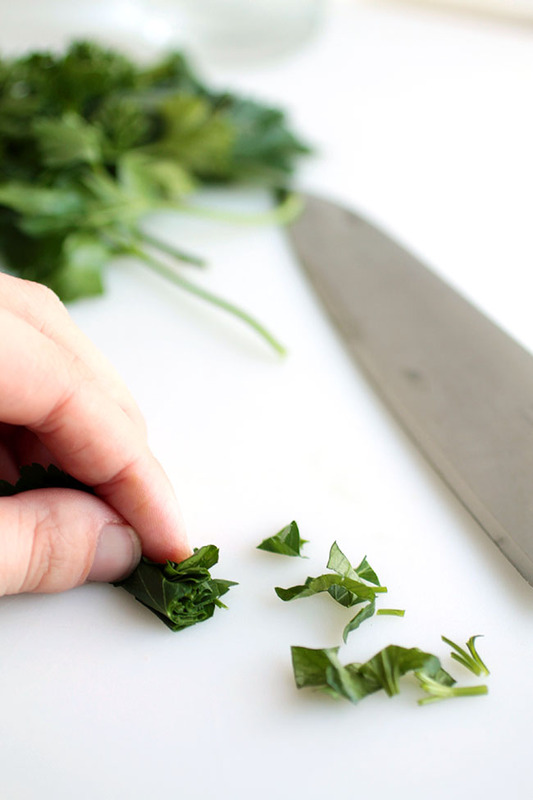 Use a SHARP SHARP SHARP knife – Dull knives can crush delicate herb leaves instead of cutting them cleanly, which can result in brown, smushy herb pieces (instead of the vibrant herb ribbons we’re going for!) For best results, use a SHARP knife. 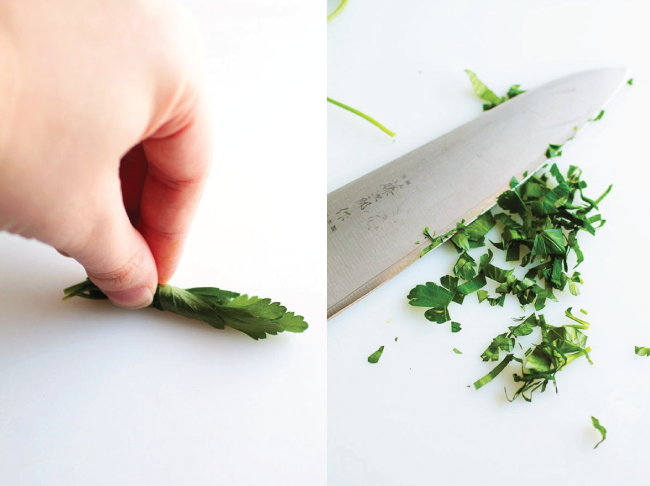 Roll, then slice – Stack a few leaves on top of each other and roll them into a little bundle, then hold the bundle with your non-knife-bearing hand while you slice in thin strokes from one end of the bundle to the other. Use proper knife technique to keep your fingers safe from accidental cuts – curl your fingers into an arch and tuck your thumb safely behind them, then use your knuckles to guide the knife and act as a buffer to keep the blade away from your fingertips. For not-so-leafy herbs like rosemary and dill, gather pieces into a small pile and rock your knife back and forth over the pile to slice the herbs into smaller pieces. Here’s my best advice for dried vs. fresh herb use: DON’T USE DRIED TENDER HERBS. Example: Have you ever tried a tomato sauce made with dried basil next to a tomato sauce made with fresh basil? They taste completely different. And fresh basil wins EVERY. SINGLE. TIME. And don’t get me wrong – I’ve used plenty of dried tender herbs (Basil, Chives, Dill, etc. etc.) in my day. But you guys – they just aren’t the same. And I’ve come to a point where I just ignore them completely, because I would SO much rather use fresh tender herbs than add what essentially tastes like dust into my food. Too much flavor is lost when tender, delicate herbs are dried (at least commercially) so my advice? Just avoid them completely. 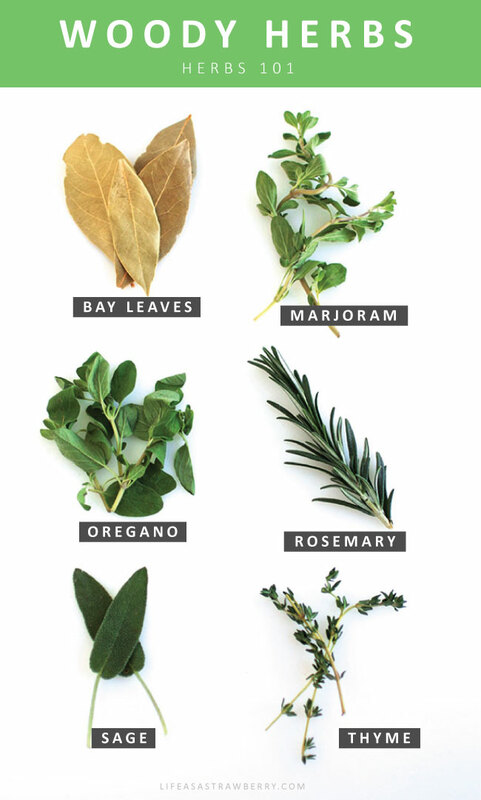 Dried rosemary, oregano, sage, and thyme are also fine substitutes when fresh versions aren’t available. Dried woody herbs can still taste a little, well, DRY, but I find that if I make sure to give them a bit of cooking time (as opposed to tossing them into a finished dish) they pick up more of the flavors and moisture around them and the dryness is masked. In general, dried herbs have a stronger, more concentrated flavor than fresh herbs. When you’re substituting dry herbs for fresh herbs in a recipe, start small – use just a pinch or two of the dried herb and taste as you go along. You can always add more of a dried herb – but you can never undo it if you accidentally add too much. Alternatively, when you’re substituting fresh herbs for dried herbs in a recipe, plan to use quite a bit more of the fresh herbs than the recipe might call for. I find that I generally have to use at 2-3 times as much of a fresh herb when I use it in place of a dried one in a recipe, but taste as you go along and make adjustments until you get the balance right! To freeze fresh tender herbs for later use, chop the herbs up and mix them with a splash of olive oil, then freeze them in ice cube trays for later use. Don’t overdo it on the olive oil, though – otherwise you’ll end up with a ton of oil and not enough herb when the cubes defrost! When cubes have frozen, remove them from the ice cube trays and store in the freezer in an airtight bag or container for 2-3 months. Add frozen herb cubes directly to sauces or sautéing vegetables for a bit of fresh, sunny flavor during colder months. Phew! We made it! For more in-depth cooking lessons, be sure to check out the rest of Cooking 101. 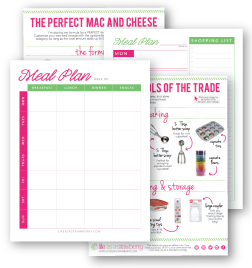 PS – Have a request for the next Cooking 101 post? Leave a comment below and let me know! Hi Ginna, glad you found it useful. Thanks! Any advice you have on growing your own fresh herbs my husband an I have tried and I’ve read a few do’s and don’ts and still have been unsuccessful. I’ve had mixed success with growing our own herbs – we live in a small apartment, so no garden. I’ve tried growing things on windowsills before, but things like basil really like full sun so they don’t last more than a few months. Sorry I can’t be more helpful! After ruining my fresh basil time and time again with improper storage, I can’t tell you how super helpful this is!!! I’m so happy you found it helpful, Ariel! Happy cooking!